Over the past few years, ground floor retail businesses have slowly returned to downtown Flint. It may not be the bustling shopping district of the fifties, but it's a vast improvement over the ghostly Saginaw Street of the nineties. Writing in the June issue of The Urbanist, Benjamin Grant tackles the nuances, history, and challenges of street-level retail. Ground floor retail has its origins in the homes of urban artisans in medieval and Roman cities. Where fortifications put space at a premium, the family home was often above the family workshop, and business was conducted through an opening onto the street. By the late 18th century, workshops were giving way to factories, and, in Paris and London, plate glass and gaslight helped create the urban storefront as we know it — a space for shopping, not making. In the 19th century, the era of the flaneur, the street itself was reinvented as a genteel public space, and grand treelined boulevards played host to a fashionable parade of shopping, self-presentation and spectacle. Modernist architects like Le Corbusier were suspicious of commerce, and found the tight, clamorous spaces of the 19th-century city oppressively filthy and congested. They sought to “free the ground plane” by raising their towers on stilt-like pilotis, so that citizens might wander through a new species of park-like city at their ease, never channeled into something as vulgar as a street. These architects peeled apart the city’s mixture, and in doing so they created separate sectors for offices, factories and homes, and built pedestrian sky bridges over sweeping expressways. The intended spaces of discovery became spaces of desolation. In the mid-to-late 20th century, the car was king. In subdivisions, shopping malls, housing projects and office complexes, inward looking, single-use environments were the norm. For nearly half a century, urban development in the U.S. got an almost total pass from pedestrian considerations. leaving a legacy of blank walls, narrow or non-existent sidewalks and dead spaces. In the 1960s, critics like Jane Jacobs and architects like Oscar Newman and Jan Gehl began investigating exactly what it was that made traditional urbanism (then under attack) work so well. They zeroed in on the interaction of building edges, public streets, and social interaction, creating some of the classic analyses in urban design. Their efforts revolutionized urban design, and their emphasis on the human scale — once dismissed as quaint and unscientific — has become planning orthodoxy. Today, walkable streets enlivened by active uses are a widely shared priority, critical to supporting transit, reducing carbon emissions and tackling chronic diseases. But bringing streets to life – especially outside city centers – can be quite a challenge. Just because planners allow, or even require, ground floor retail spaces, does not mean there will be ground-floor retail. Retailers, who live and die according to foot traffic, visibility and neighboring stores, are very sensitive to both location and quality of their spaces and they are well aware that if you build it, customers won’t automatically come. Planners don’t create cafes (or restaurants or grocery stores) and for the most part, neither do developers. Entrepreneurs do. It is true that a building without a storefront will never contain a store. On the other hand, the world is full of empty storefronts. The weakness of ground-floor retail in mixed-use construction is so notorious that developers routinely write it off, assuming no revenue at all. 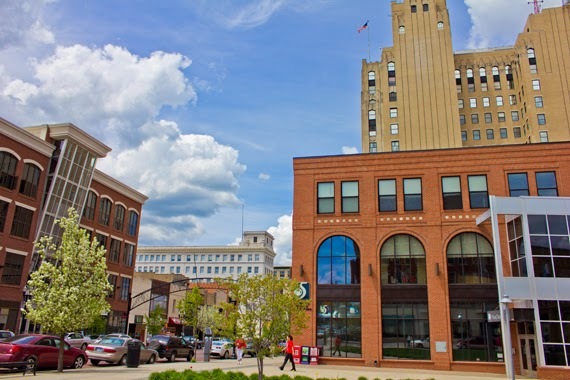 But it's clear that making downtown Flint a welcoming gathering place is a key part of improving the city, along with helping the city's neighborhoods rebound from abandonment and decay. Public life is the essence of urbanism. The city’s ability to facilitate movement, commerce, democracy, innovation and creativity resides in the currents and eddies of human beings at the boundary of public and private space, where homes, jobs, shops and civic buildings touch streets, parks and plazas. In a good urban neighborhood, the ground floors of the buildings work symbiotically with the surrounding sidewalks and public spaces. Together they provide a continuous network of pathways and experiences that are active, safe, comfortable and engaging. The ground-floor café (and retail more generally) is but one of many good ways for buildings to meet the street. After all, even a coffee-crazed town like San Francisco can’t have a café — or even retail — in every building. A good city requires solutions as varied as its fabric and its people and must constantly invent new ones.